Chancellor Carol L. Folt will leave the University at the end of January — in 16 days — not at the end of this academic year in May, as she announced Monday. The UNC System Board of Governors announced the accelerated resignation Tuesday after a closed session of less than half an hour. Earlier in the day, Folt had said at a news conference that the end of the semester was the right time for her to leave. She had said she had plans to continue her work for Carolina during the spring. Folt on Monday ordered the last of the Confederate monument Silent Sam — its pedestal and commemorative plaques — removed from the campus. That was carried out overnight, and workers were landscaping the spot on Tuesday. Board of Governors’ Chair Harry Smith made it clear the board was unhappy with the way Folt handled the pedestal. The motion approved by the Board of Governors included authorization for system Interim President Dr. William Roper to appoint an interim chancellor before Jan. 31 if he sees fit. While members of the Board of Trustees praised her accomplishments and thanked her for her service, Smith said he was caught off guard. The BOG was meeting in closed session Monday about “issues related to UNC Chapel Hill’s leadership,” he said, and had not been notified of Folt’s resignation before the public announcement. The most recent chapter in the Silent Sam story has Folt and the trustees proposing on Dec. 3 that the University build a history and education center near the campus’ southern border that would house the statue and the BOG responding two weeks later that the $5.3 million price tag for such a center was out of the question. The board set up a five-member task force of its members to work with the Board of Trustees, the chancellor and top administrative staff to come up with a different plan for disposition of the statue, which was pulled to the ground by its detractors in August. Folt’s administration faced two of the most tumultuous issues in recent University history, both of which kept UNC in national headlines. 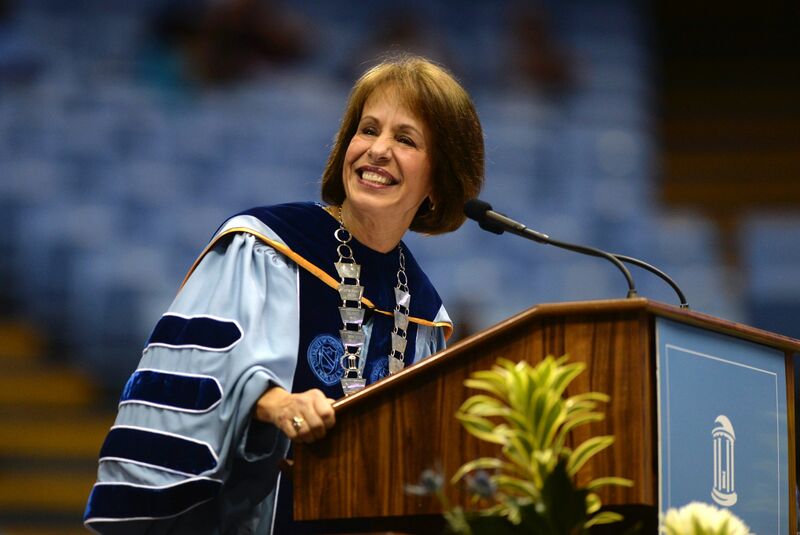 When she became chancellor in July 2013, Folt inherited at its midpoint what became a seven-year athletics-academics drama over fraudulent classes. That ultimately was resolved in October 2017, when the NCAA’s Committee on Infractions said it found no violations of its rules and announced that the University would not be sanctioned. A simmering discontent with the University’s Confederate statue began to build in spring 2015, when the trustees voted to change the name of Saunders Hall because of its namesake’s leadership of the Ku Klux Klan. Large-scale protests and face-offs between Silent Sam’s detractors and supporters, sometimes violent, climaxed on Aug. 20, 2018, when activists pulled the statue to the ground. Folt had favored removing the statue over safety and security concerns but was stymied by a state law prohibiting its removal. 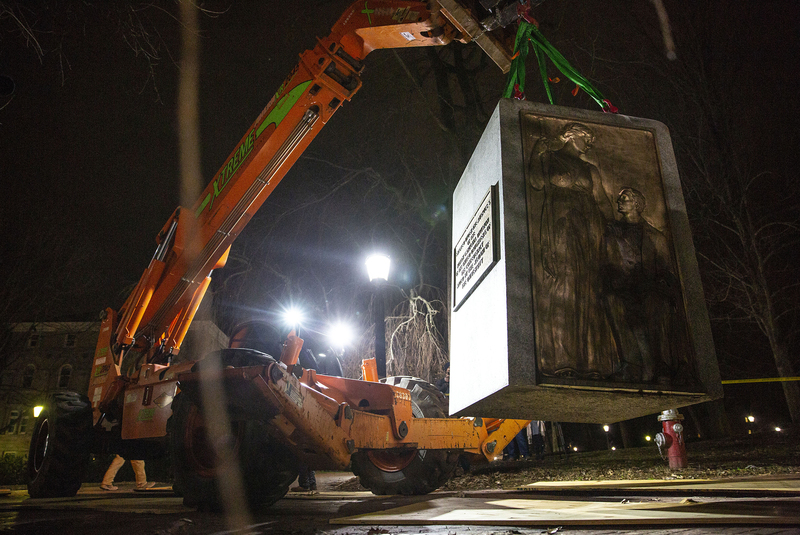 As Folt authorized the removal of the statue’s base and commemorative plaques on the day she announced her decision to resign, the BOG and trustees were back at the drawing board over what to do with the statue. In her statement Monday, Folt reiterated that “the independent panel of safety experts we convened in November to help us review options for the monument that we presented to the UNC [System] Board of Governors made a strong and compelling case for risks to public safety. The fact that despite our best efforts even since then, threats have continued to grow and place our community at serious risk has led me to authorize this action. The monument, commissioned by the Daughters of the Confederacy, was erected in 1913 “in memory of all University students, living and dead, who served in the Confederacy.” Its presence has made some people and groups unhappy at intervals since the 1950s. The outcry against its continued presence has grown louder in the past 10 years. An organization of students and others called the Real Silent Sam Coalition emerged in about 2011, calling the statue offensive to people of color and at first suggesting UNC erect a reinterpretation plaque to explain it. Students have said they were insulted by its presence — what they call a symbol of the Confederacy’s loyalty to the institution of slavery — some adding that they didn’t feel safe when counterprotesters came to the campus. Following the NCAA’s decision on the athletics-academics issues, Folt said: “Carolina long ago publicly accepted responsibility for what happened in the past. One of the highest priorities of this administration has been to resolve this issue by following the facts, understanding what occurred and taking every opportunity to make our University stronger. “I believe we have done everything possible to correct and move beyond the past academic irregularities and have established very robust processes to prevent them from recurring,” and she emphasized that the University instituted some 70 reforms in academic policy and practice as a result of the revelations. In April 2013, Folt declared she was going public after a 30-year career at tiny, private, prestigious Dartmouth College. She inherited a fifth-ranked public (which it still is) that was 10th among all American universities in government research funding (it is now fifth), with a student body growing in prestige every year. She was greeted by a decidedly conservative turn in state leadership, representatives who were determined to change the way its public universities are funded and the criteria on which their degrees are valued. She also would become familiar with the term “under investigation.” Her predecessor, Holden Thorp ’86, once envisioned being in the job for many years but left after five as UNC was rocked by the athletics-academics scandal. Folt was Dartmouth’s interim president and declined to be a candidate for the permanent job. The Board of Governors elected her after then-system President Thomas Ross ’75 (JD) explained that he had sought a leader who supported the liberal arts, would work to keep tuition low in accordance with the state constitution, was a proven fundraiser and would understand that academics are the first priority but recognize that athletics have an important role in campus life. At Dartmouth, Carolina’s first female CEO had been provost, acting provost, dean of the Faculty of Arts & Sciences, associate dean of the Faculty for Interdisciplinary Programs, dean of graduate studies, and associate director of the interdisciplinary Superfund Basic Research Program. She earned her bachelor’s and master’s degrees from UC-Santa Barbara, and her doctorate from UC-Davis. She did postdoctoral work at Michigan State University. Folt lost the financial support of her parents when she chose an out-of-state school and worked to pay her way through Santa Barbara.